As a librarian, I like to experiment with different ways to disseminate information. As an imperfect librarian, I end up with multiple lists of my publications. Here are a few. My contributions to the library's list. Partlo, Kristin. 2014. "From Data to Creation of Meaning Part II: Data Librarian as Translator." IASSIST Quarterly 38 (2):12-15. http://www.iassistdata.org/iq/data-creation-meaning-part-ii-data-librarian-translator. 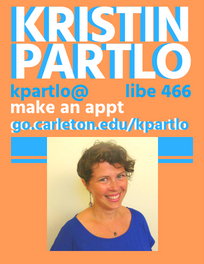 Partlo, Kristin. 2009. "The Pedagogical Data Reference Interview." IASSIST Quarterly 33 (4):6-10. http://www.iassistdata.org/iq/pedagogical-data-reference-interview. Partlo, Kristin, Diana Symons, and Jonathan Carlson. 2015. "Revolutionary or Evolutionary: Making Research Data Management Manageable." In Creating Research Infrastructures in the 21st-Century Academic Library, edited by Bradford Lee Eden, 175-201. Lanham, Maryland: Rowman & Littlefield. Leebaw, Danya, Kristin Partlo, and Heather Tompkins. 2013. "'How Is This Different From Critical Thinking? ': The Risks and Rewards of Deepening Faculty Involvement in an Information Literacy Rubric." Imagine, Innovate, Inspire: The Proceedings of the ACRL 2013 Conference, April 10-13, 2013, Indianapolis, IN. http://www.ala.org/acrl/sites/ala.org.acrl/files/content/conferences/confsandpreconfs/2013/papers/LeebawPartloTompkins_HowIsThis.pdf. Partlo, Kristin and Ann Zawistoski. 2011. "Library Confidential: Boundaries and Benefits of Demystifying Student Appointments for Faculty." Declaration of Independence: The Proceedings of the ACRL 2011 Conference, March 30-April 2, 2011, Philadelphia, PA. http://www.ala.org/acrl/files/conferences/confsandpreconfs/national/2011/papers/library_confidential.pdf. "Where's the Data? Building Data Services for Liberal Arts Colleges" with Gina Bastone and Ryan Clement, a panel at ACRL 2015, Portland, OR, March 27. "From Data to Creation of Meaning Part II: Data Librarian as Translator" paper presented at IASSIST 2014, Toronto, Canada, Wednesday, June 4, Session 3J "Developing Meaningful Data Support Roles and Services." [paper, presentation]. "Supporting Undergrads with Data," IASSIST 2008 workshop with Paula Lackie and Michelle Edwards. "Start Seeing Numbers" ACRL conference workshop with Ann Zawistoski, Paula Lackie and Doug Foxgrover.